I’m a million times lucky when it comes to my main job – I work in the charity sector and I absolutely love it! On the family front, my husband and son make me equally lucky. That’s where my focus is (let’s be frank, so it should) and, in the middle of those, I want to fit some me time and social time for friends and wider family. The truth is that the whole re-evaluation of priorities I’ve been doing in the last couple of years never really took into account that I should look at what, within jewellery making, I don’t have time for so here it goes! While the writing will be sporadic, I absolutely love it and it’s a great outlet for me so that might be slowing down (it already has) but it’s not stopping! The selling… well, I’ve come to the decision that I need to close my Etsy shop. Don’t get me wrong, Etsy has all my recommendations as a great selling platform (ohhh, and the lovely things you can buy! ), but, realistically I can’t give it much attention so, let’s be productive! BeeBiju’s Instagram account is coming back to life very soon and in full force and that will be my main platform to showcase my products. There, I will also take you on the journey of re-discovering jewellery making with me. Stay tuned and keep creating (we all do, constantly 😊). Excitement!! I finally have the opportunity to show you my new workspace! We moved into our home less than two years ago, 3 weeks ahead of my son making his first appearance… needless to say it was a really busy time (during which I was surprisingly calm – must have been the pregnancy hormones and the endless help from friends and family). At first I was a bit nervous as I didn’t think I had the space to set my jewellery making area. But once we moved in and got a bit organised, I then realised that I could use a tiny room that was initially in the plans as storage and, voilà, we have an office! It’s now used both by my husband and myself for work, so it was definitely a good decision! After getting light, sockets and some shelves installed, here it is… my beloved little workspace. These are IKEA knife racks that I screwed into the wall. I completely vouch for them, they have a really strong hold! You might remember this from a previous post, I’ve had it for years and I use it all the time! I love my little workspace and have promised myself that I will be using it on a more regular basis – and you will see the results in the next posts. I should have put money in a jar every time I talked about returning and didn’t follow through… I’m pretty sure I’d be rich by now!! That inspires me to start paying more attention to little details and make better use of my time… so I definitely need to plan ahead! To make it easier for me to keep track and hopefully more interesting for you as a reader, I’ve come up with a calendar for my posts. The idea is to have a new topic every month so in August, you’ll read about my supplies and working space (which is different from last time). Sometimes, the simpler, the better! My favourite item this month is not a part of my new Travelling Collection nor a piece that took me 10 million hours to do! These earrings speak for themselves, with their simplicity and uniqueness! The adorable cat having some “thinking-time” in the Moon is a genius idea (thumbs up to the author)!! Anyone else identify themselves with this lovely pair of earrings? I know I do! As per usual, here is my Promo Code – BEEBIJUBLOG6 – available until my next post is up. Hi, you! First of all, apologies for my absence. While I was busy travelling, working and with other bits and pieces, I didn’t realise that almost THREE MONTHS have passed (scary, no?!)! Now, let’s put in practice something I’ve wanted to do for some time: a travelling collection. During my honeymoon in Cuba, I was in a complete “offline” mode but I kicked myself a bit when I came back, very happy, extremely exhausted and… beads free – yes, I actually forgot! While in Havana, the hubby and I visited a lot of gorgeous places and had a very interesting cultural learning experience, to say the least. But despite the fact our living room has a little bit of Cuban art, my craft drawers don’t! And I’m happy to say that they all have a purpose! While I feel quite comfortable with the idea of making earrings (as you will see with most of the results! ), I gave it a go with a few bracelets as well. And I’m thrilled to share them on Etsy, as the first items in my “Around the World” collection! Feel free to take a look and let me know what you think. And as per usual, here is a discount code, in case you decide to buy: BEEBIJUBLOG5. I am also taking a bit of time to focus on my shop, not only to make new pieces but also to have new material to continue to deliver this blog. I will be back in January and, in the meantime, if there is something you would like to see featured in Bee’s creations, leave me a note! This blog is for you so who better than, well, you to tell me what to write about? As suggested by a good friend and fellow blogger (see her blog here -> TheHouseOfLotz), here is my first “monthly pick” blog post, in which I present, from the items I created in the past month, my favourite. This month, it’s a no-brainer! 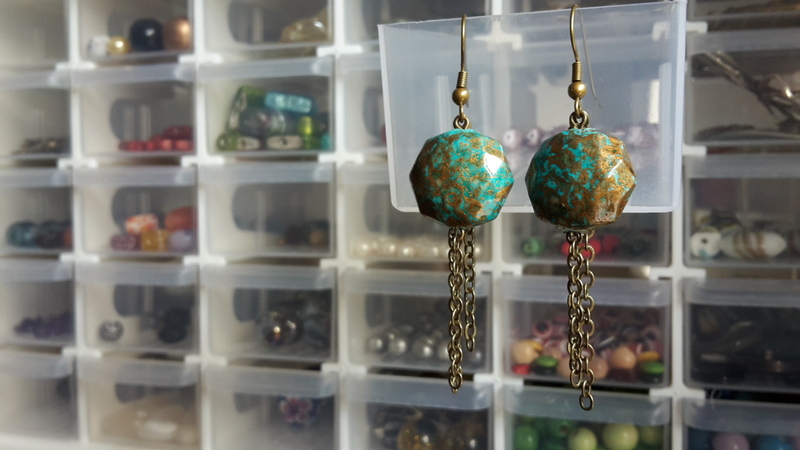 Having had lots to catch up on, I wasn’t able to create as many items as I would have liked… but I managed a few and the one I enjoyed doing the most was definitely a pair of earrings made with beads I got for my birthday! These came on the post as a little surprise from my sister-in-law: a lovely necklace, a super-fancy magnifier (great idea!!) and of course, my new gorgeous beads! I could not wait to try them out and here is what I came up with. This pair of earrings is on sale on my shop and if you would like to buy it, feel free to use this promo code for 15% discount: BEEBIJUBLOG1 (valid until my next blog post goes up in 10 days)!